*This post is sponsored by RPM Wood Finishes Group and contains affiliate links. All opinions are uninfluenced and my own. Last week I shared building plans with you guys so you can make your own Mid Century Nightstand with Hidden Shoe Storage. Today, I'm back and showing you how I achieved a professional looking stained finish on that piece. I teamed up again with Mohawk Finishing and H. Behlen and made a video tutorial so you can see what each step looks like. You know I must love you guys, because I would much rather be in my garage covered in sawdust than making a video, but I want to give you my best. 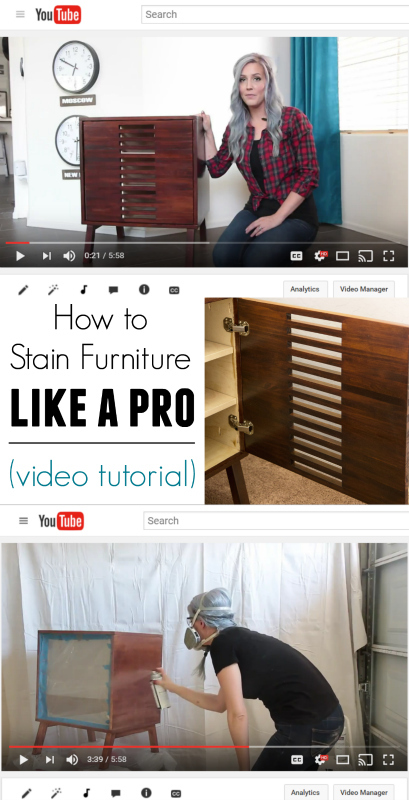 Scroll down and learn how to stain furniture like a pro! Did I miss the part where you use the Rockhard Table Top Varnish? What is that product for? Thanks. It looks beautiful!! You're right Karen, that was a mistake. I've removed the Rockhard from the list. Thanks for catching that! Great video, your finish looks fantastic! Great! I like this video tutorial very much. Likewise can you share me cleaning tips?? Awesome Video Elisha!! I need to use lacquer more, this piece is beautiful!